Sterling Weekly for the Week of March 5th, 2012 - A Look at Bond Prices and Higher Rates - Sterling Holdings & Investments, LLC. Since the previous edition of the Sterling Weekly the Dow Jones Industrial Average declined 5.38 points or approximately 0.05% to 12,977.57; essentially unchanged over the course of the week. The trend of the overall market continues to be to the upside. However, I continue to have concerns that the Dow Jones Industrial Average looks as if it could be entering an area of resistance to further upside movement. Additionally the weakness in the Dow Jones Transportation Average is a cause for a point of concern, as historically it has not been the norm to see significant moves upwards in the Dow Jones Industrial Average without a confirming move upwards as well by the Dow Jones Transportation Average. Additionally it should be noted that when the Dow Jones Transportation Average starts to move lower, it is typically a warning sign that the Dow Jones Industrial Average will move lower as well. In other words, I am concerned that this recent move higher by the Dow Jones Industrial Average will run out of steam. I thought it would be very interesting to see what would happen to the market value of these bonds if interest rates were to rise to those levels. Since nobody expects that to happen over night, I thought over a 12 month period would be reasonable basis for analysis. If we were to see interest rates on those bonds rise to those levels over the course of the next 12 months, the impact on bond prices would be very dramatic. If one year from now, interest rates rose to 5.00%, 5.20%, and 5.25% respectively for 5, 10, and 30 year bonds issued today, the market value of those bonds with a face value of $1,000 today would be approximately $817 for the 5-year bond, $750 for the 10-year bond, and $670 for the 30-year bond. This would equate to an 18% loss for holders of the 5-year bond, 25% loss for the 10-year bond holders, and a 33% loss for holders of the 30-year bond. This would be extremely devastating for pension funds, ETFs, and mutual funds holding these bonds, as well as any individual bond holders. Those are just the numbers I expect if interest rates return to their prior levels and we do not see any real inflation. If we see inflation pick up, and the Federal Reserve raise rates to combat the inflation, the I think the rate on the 30-year bond could go to almost 7.5%, then based upon historic rate levels, it would be reasonable to expect the yield on the 5-year bond to go to approximately 7%, with the yield on the 10-year bond at approximately 7.2%. 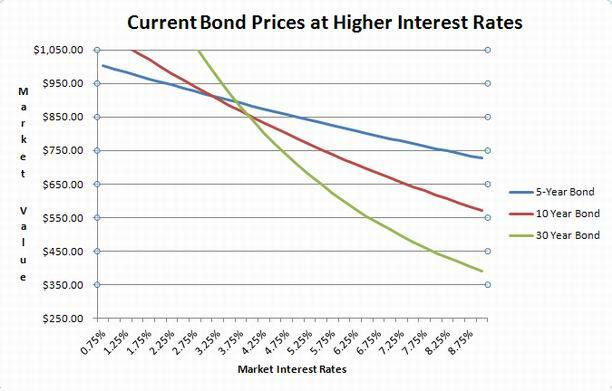 At these interest rate levels, the market value of a 5-year bond would be approximately $786 resulting in a loss of approximately 21% from its current market value. The value of the 10-Year bond would be approximately $654 resulting in an approximate loss of 34.5%; and the value of the 30-year bond would be approximately $486 resulting in an approximate loss of 51.4%. Those would be exceptionally devastating numbers to the US and world economy. Let us not forget that markets have a tendency to over react, and swing too far in the opposite direction that they went during the bubble. Just look at the market for houses following the bursting of the housing bubble, and the stock market following the bursting of the dotcom bubble. If there is a bond market bubble, and its bursts with the typical market panic that follows a bubble bursting, then I would not be surprised to see interest rates on the 30-year bond shoot towards the 9% level, before settling back in the 7% range. I have included a chart below of the market value of bonds at the current interest rate levels and where the values would be in rates rose to the levels indicated within a 12 month period of time. At some point in time we are going to see a normalization in interest rates. When that happens I think that it could very easily have a devastating effect on brokerage accounts, retirement assets, pension plans, mutual funds, and a whole host of other assets. This in turn could have a very dramatic and negative effect on the US and world economy. Higher interest rates would very easily send our the Federal deficit skyrocketing, and possibly cause the deficit to spiral out of control resulting in some extreme pain as the government struggles to bring it back under control. In my opinion it is not a question of “if it will happen”, but when it when it will happen. I will continue to do some research and see if I can come up with some figures on the amount of Federal debt outstanding in each of these bond categories, and I will take a look to see how I would be moving to protect ourselves. As part of our new services we are now publishing a blog. The primary focus of our blog is a daily market commentary. Sterling Investment Services publishes custom research on micro and small cap companies. Our focus is on companies that are not receiving research coverage from the brokerage community. Our latest research report Probe Manufacturing, Inc. (OTC: ‘PFMI’) This company is a contract electronics that we feel is an interesting turn around story. To see a of our report, please here. Companies that are interested in obtaining research coverage should click here. Disclaimer: The Sterling Investments series of newsletters is produced by Sterling Investment Services, Inc. All information used in the production has been obtained from sources believed to be reliable and accurate. Sterling Investment Services does not warrant or assume any liability for inaccuracy of the information used to produce our publications. To receive further information on these services please visit our web page at: www.sterlinginvestments.com If you would like to contact us our fax # is (404)-816-8830 Email address is: enelson@sterlinginvestments.com Sterling Investment Services may hold positions in the securities recommended or may be providing consulting services to the companies mentioned within this report.